This post is about a product I received complimentary for testing purposes, but my review is an honest appraisal of my opinion of this product. I hope all of my American readers had a wonderful Thanksgiving! You might be starting to get tired of turkey leftovers, so today I'm suggesting a product I recently tried and would definitely buy again. Quite a while ago, I received a "Comfort Voxbox" from Influenster, with a variety of products to review. At least, I should have received it quite a while ago. Actually, I was never notified that it was available for pickup, so it was undelivered for considerably longer than it should have been. In any event, I finally received it! The timing turned out to be quite perfect! My son had his wisdom teeth extracted just over a week ago. All four were impacted and it was a complicated case. He has done extremely well post-surgically, but the first few days it was challenging to think of foods that he could eat. Ice cream, pudding, and macaroni-and-cheese were all good choices and things I had on hand. 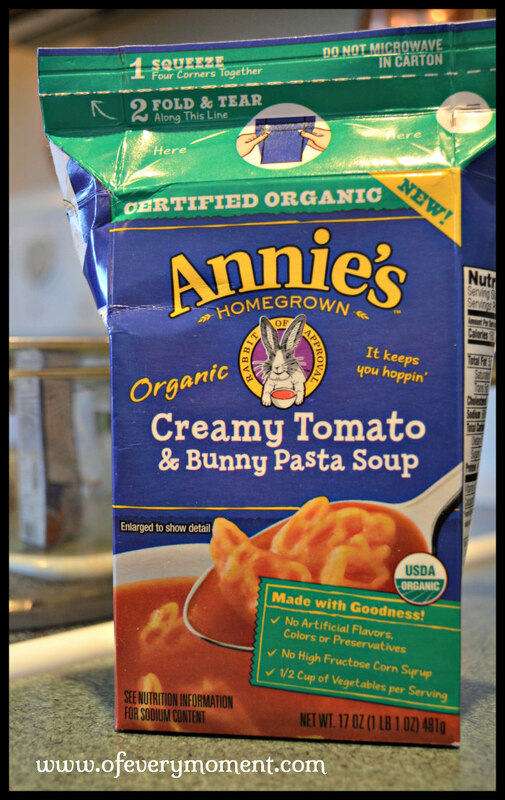 When he tired of these, however, I offered him one of the things I received in the VoxBox: Annie's Creamy Tomato and Bunny Pasta Soup . I was a little worried that my 18-year old son might balk a little at the bunny-shaped pasta noodles, but quite the opposite! He said the soup was really very good, and the noodles were soft enough to offer no discomfort for his sore mouth. He commented that since all you have to do to prepare it is heat the contents of the cardboard container, it would be a good meal to take backpacking. contains 1/2 cup of vegetables per serving. 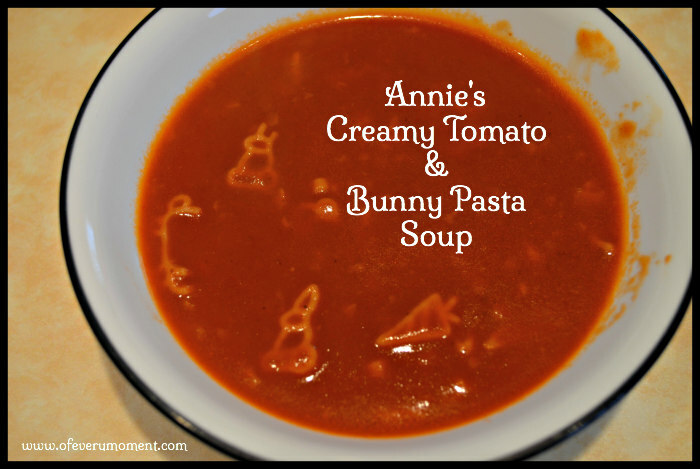 I can recommend this soup as a good thing to eat after dental work, to take on a camping trip, or just for an everyday lunch! In fact, it would be perfect served with grilled cheese sandwiches and some crackers. 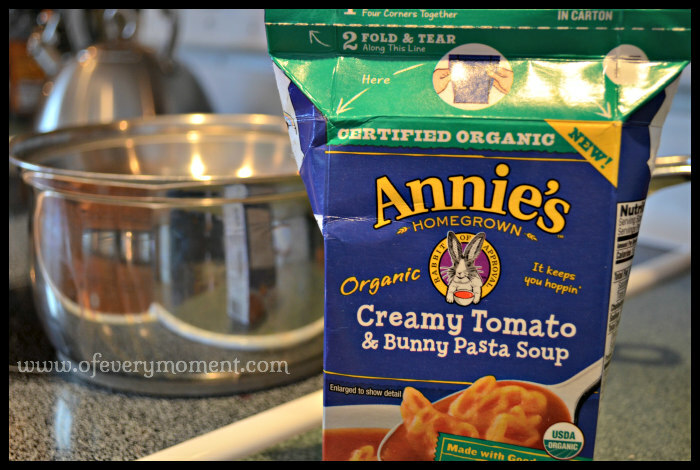 Have you ever tried any of Annie's Homegrown Products? "Sorry, it's a secret family recipe." "Well, I'd share it with you, but I've been sworn to secrecy." Have you ever received this sort of response when you've requested a recipe from someone? When I was in my teens and early 20's, I was reluctant to share my favorite recipes with friends and family. If they loved something I cooked or baked, then I wanted to be the person who could make them happy by creating it for them again. I reasoned that once they had the recipe, then they would be able to prepare it for themselves or someone else, and I would no longer have the power to bring them that joy. Fortunately, it didn't take me long to understand that this logic was silly. If I really wanted them to be happy, then it wouldn't matter who made the recipe, as long as they got to eat or serve that particular dish or dessert! Now, whenever I've made a recipe that turns out well, I always welcome a time or place to share it. While I am partially motivated by wanting to spread the enjoyment of a good thing, I must admit I also have a selfish reason. I have realized that recipes can quite easily become lost or even destroyed, as in the case of (heaven forbid) a fire or a flood. I find it comforting to know that other people have copies of my recipes, and that I could obtain a duplicate from someone if I was ever missing mine. Every time I share a recipe on this blog it is for my readers benefit, but I'm also happy knowing that it has just become a little safer for my family and friends and future generations to enjoy. Many cooks are known within their family for the special dishes that they make. Those recipes may even become named after them. Aunt Blanche's Dump Salad, Aunt Ginny's Sweet Potato Casserole, Grandma's Chocolate Chip Brownies, and Aunt Audrey's Christmas Trifle are just a few of the headings on recipe cards to which I frequently refer. Sometimes we remember and long for a particular item, but no one has the recipe. The baked chicken my grandmother often served when we would have a Sunday dinner with her is one such recipe. I would truly love to go back in time and ask her to write down the method with which she used to make it. 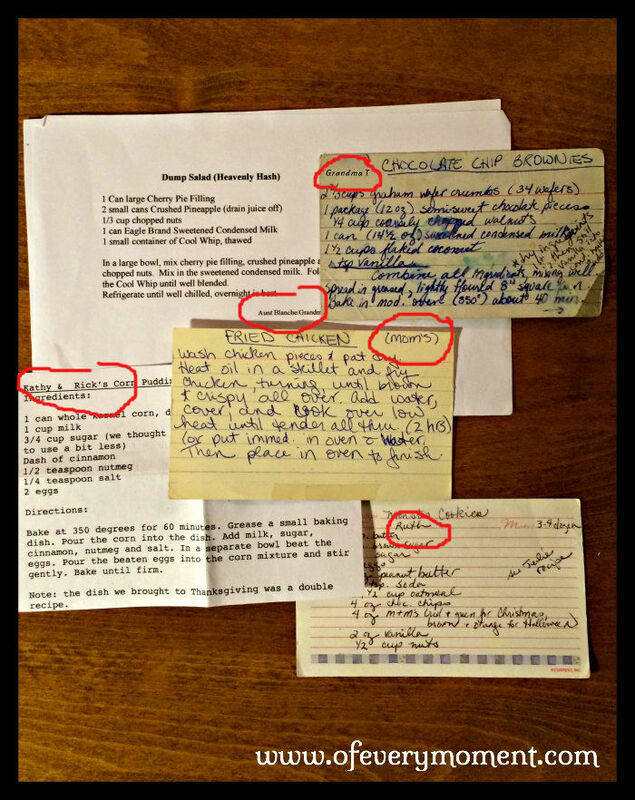 Memories of a person or event are often passed from generation-to-generation by the sharing of a recipe. I think that is a very lovely gift indeed, and I hope my own legacy is richly endowed with delicious recipes. My Saturday Suggestion for today is to Share Your Recipes! Do you agree that this is a good idea? In my last post, I stated that except for publishing on Saturdays, I would be taking a blog vacation this month. In light of the events of this past weekend, however, I feel like I need to express my sympathies here. My heart is heavy for the victims of the recent terrorist acts in Paris, and I am as shocked and horrified as anyone else. The thing is, though, I am not just sorrowful for Paris, I am sad for all of us ... every person on this earth. I am sad that we have not yet figured out how to all live in peace. Can you imagine how wonderful our world would be, if we solved everything with words and learned to get along? Some of you may remember this photo from my blog post on May 19, 2014, An Organized Photo Collection: I WISH! When I wrote that post, I committed to getting my photo collection more organized before my son graduates from high school this year. Sadly, in the months that have transpired since the post was published, I have made no progress with this. Another Veteran's Day has come and gone, and Thanksgiving is coming up. I put the Halloween decorations away and decorated the house for Thanksgiving in record time this year. The snow we got here in Montana last week never completely melted, and more has been added to it. Our bodies have begun to adjust to day-light saving time, although those dark mornings and early night falls are something I will never like. We seem to have made the leap from fall to winter, even though that season doesn't officially begin until December 21st. We all have periods of time in our lives upon which we look back and think, "Wow. If that event had not happened, how different my life would be." November 10th marks one of those life-changing dates for me. My quest to "make the most - - of every moment" and the subsequent creation of this blog may have originated from a major lifestyle change that occured for me on that date. Forty-some years ago my father, a petroleum engineer, accepted an overseas position. On November 10th, my family left our rural home just outside Calgary, Alberta, Canada to move to Spain. I remember my hesitancy to leave my friends, and my life as I had always know it. I can still recall the excitement and wonder I felt, however, when we arrived in Europe and settled in there. Within a few months, I realized what a lucky opportunity I had been granted. That move across the globe heavily influenced the person whom I was to become, and the life that I would live. Every year on November 10th, I have thoughts of gratitude for the adventure my parents choose for us all to embark upon. Newly arrived in Europe - weren't we quite the tourists? Check out those plaid pants! These were the days before selfies - my dad is not pictured because he took the photo. In mid-November, I also celebrate the anniversary of another major milestone, and a few minor ones, as well. Two years ago on November 13th, my first piece of freelance writing was published on-line. I have written something nearly every day since then. I have always loved to cook, but I might not have the confidence to blog about my recipes if it had not been for some successful Thanksgiving challenges. One example of this would be the time I offered to bake the pumpkin pies for a large Thanksgiving family gathering when I was still in college, when I was still in college, and the pumpkin pie recipe I developed then and have been making ever since. Of course, not all of anyone's important milestones in life occur in just one month of the year. For me, however, the second week in November and coincidentally Remembrance Day (Veteran's Day in the US) seems to be a time when I stop and appreciate the moments of my past which have shaped my future. November 11th is Remembrance Day (Armistice Day or Veteran's Day as it is also called, depending on where you live) and it is a date designated for us to remember that our freedom has come at a price. Without the efforts of many soldiers, our lives would all be different. My memory of leaving Canada and arriving in London (where we stayed for a week while my dad did some work at the home office of his new company) is jumbled with flashbacks of people wearing red poppies on their lapels - in both the country that I left, and the one to which I arrived. From this observation, I gained a global perspective I didn't have before. The 11th of November has been a day for me ever since to think about all of the lives lost to all the wars, in every country of the world. Our first instinct as human beings is to resist and dislike change. Looking back, however, I realize that some of the scariest and at times even the least appealing moments in my life have been the ones to take me in the best directions. This reflection provides me with a good reminder that it is important to take some risks, and get out of my comfort zone once in a while. One year ago today, I wrote a different post about November being a month for memories. A number of readers shared their November remembrances in the comments. What memories has this triggered for you? I am often asked how long it takes me to write a blog post. For me, this is the often the easiest part of blogging. Today I'm offering a glimpse of some other ways large chunks of time can be spent blogging. Have you ever gotten confident with a skill, only to be immediately humbled by it? Saturday Suggestion: On the next warm day, put holiday lights up! Thinking about what to write today, I came up with a possible idea for a new blog series. I'm looking out at my snow-covered trees and property, and hoping the white stuff will melt. When and if it does, I plan to scurry out there, and string my holiday lights, before it snows again. I am still seeing a lot of snow outside my kitchen window! And just like that ... we have winter in Montana. Today, I am simply going to write some words of gratitude. When I began this blog, I really had no understanding that it was even possible to gain an audience. It began mostly just as a writing exercise and a creative outlet for me. 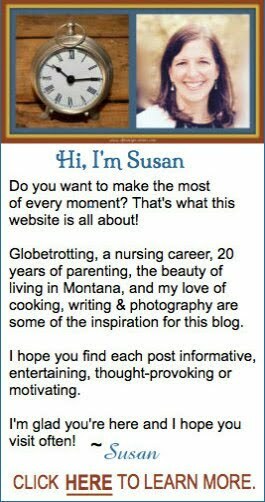 It is so nice (though sometimes still a little intimidating) to know that there are people who read the posts I publish! Whether you have read just one post, you are a sporadic visitor, or one of my loyal readers - I appreciate you taking the time to visit The Most -- of Every Moment. 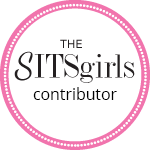 I am very grateful for the readers who loyally comment on nearly every post, especially those who are busy writing blogs themselves. Even in the past months, when I have been commenting on and sharing your posts less and less, you have faithfully continued to support mine. I am looking forward to getting back to a better blog visiting schedule soon - and catch up with all that I have missed. November is National Blog Posting Month, "NaBloPoMo." While I do not plan to increase my posting schedule to daily this month, I did take a peek at the daily prompts posted on the Blogher website. Some of them look really fun to answer, and may be my inspiration for a few posts. Today, the prompt on Blogher was "What was the one toy that a friend had that you wished you had when you were little?" My answer is definitely an Easy Bake Oven . I remember desperately envying my friends for having one. My mom's response to my request was always, "Why do you need one of those, when I can teach you how to use my oven?" I couldn't resist buying my daughter her very own easy bake oven when she was young and it was practically being given away during a Black Friday sale. It was a lot of fun for her at first, but then it did not get a lot of use, and eventually we gave it away. In retrospect - I think my mom's decision was a smart one. Her patience while teaching me to cook and bake, and learn to use her oven led to my lifelong love of baking! How would you answer the November 2nd Blogher NaBloPoMom prompt question above?